What is the Meaning of Passion-bearing? 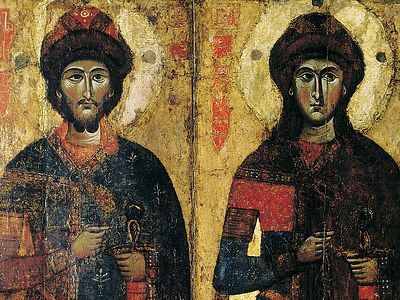 The holy, right-believing Prince-Passion-bearers Boris and Gleb were the first saints to be canonized in Rus’. Despite this, many Christians, and especially in our time, do not understand the meaning of their podvig. And really, where is the virtue in being meekly killed? Deacon Valery Dukhanin, Fr. Dimitry Shishkin, and Archpriest Artemy Vladimirov speak about the meaning and importance of the podvig of the holy princes and the last Russian tsar. The murder of Boris and his servant George Urgin in the tent. Scene from an icon of Sts. Boris and Gleb Church in Zaprudi, Kolomna. End of the fourteenth century. Passion-bearing, as far as we know, is mainly a Russian type of holiness, because the historical path of Russia is a path of constant suffering. You can behave differently in the midst of suffering, as one of the thieves on Golgotha murmured about his faith, and boldly demanded that Christ save him from torment, while the other confessed himself worthy of such affliction, and humbly prayed to the Savior—and he was received into Paradise. Such a meek acceptance of death with the confession of Christ raises the soul to where the Lord Jesus Christ Himself is. Passion-bearers are those Christians who bore heavy sufferings and accepted death from their killers. They did not demand a renunciation of Christ—confession of faith was not the reason for their murder, but some special role in public life. Often, they were victims of political assassinations. In particular, Sts. Andrew Bogolyubsky, Michael of Tver, and Dimitry of Uglich suffered in this way. The virtue, of course, is not in being innocently killed, but in meeting death at the hands of evil men without any personal malice towards them. The significance of the podvig of passion-bearing is in the Christian love for enemies, gentleness and patience in the image of Christ Himself. They are like unto Christ in His innocent suffering, for He humbly accepted crucifixion, and forgave His killers on the Cross. Clearly, people who lived with such disposition of soul, who meekly met their hour of death, are an example for us of patience, humility, and love in the image of Christ Himself. The first podvig of passion-bearing in Rus’ was manifested by Sts. Boris and Gleb. They fell victim to another’s cunning and conspiracy. They humbly refused to raise a hand against a brother, agreeing it was better to meekly accept death than to shed the blood of their persecutors. Fire cannot be put out with a combustible compound, and enmity is extinguished only by love. Holy Scripture says, If a man say, I love God, and hateth his brother, he is a liar. Recall that when Svyatopolk of his own will occupied the Kievan throne, his retinue invited Boris to go to Kiev, but he refused, and the retinue abandoned him, leaving him alone, because he did not want to spill the blood of his brother and other Russians. Both Boris and Gleb were warned of the impending atrocity, but humbly accepted death, following the example of the Savior. The innocence and meekness of Sts. Boris and Gleb has always resonated with the Russian people. They have been loved by the Russian people from olden times, for the unique purity of their souls, and the absence of even the remotest shadow of malice or deceit. It has always aroused reverence for them among the Russian people. Therefore, in ancient Russian narratives, their deaths are compared with the death of Righteous Abel at the hands of his brother Cain. Moreover, Sts. Boris and Gleb are the first canonized Russian saints and are always venerated as the first Heavenly protectors of the Russian land. The murder of Gleb in a boat. Scene from an icon of Sts. Boris and Gleb Church in Zaprudi, Kolomna. Late fourteenth century. Passion-bearing is a special gift, a grace, which Christians acquire, enduring an innocent, martyric end at the hands of the wicked, with humility and without murmuring. Passion-bearing is podvig which, from a superficial glance, may seems a manifestation of weakness, but in fact it is a manifestation of exceptional faith and bravery. Wherein lies this faith and this courage? In that a man firmly believes that in dying for truth, and in not resisting enemies, he partakes in the power and life of Christ Himself, Who prayed in the Garden of Gethsemane until He sweated blood, languishing in the agony of impending death, but voluntarily enduring suffering and death itself for the sake of obedience to the will of God and the salvation of us sinners. The first passion-bearers of the Russian Church were the holy princes, the brothers Boris and Gleb—honored with the great crowns of passion-bearing, not because they suffered a violent, “necessary” death. The chronicler notes that it’s significant that many have died in battle, in feats of arms, but the holy brothers were honored precisely because they did not want to raise a hand against their older brother Svyatopolk. They showed extreme humility, love, and obedience to their father, Great Prince Vladimir, whom their older brother succeeded. Albeit perhaps indirectly, they fulfilled the commandment to honor father and mother. Here are the words of Boris: “I will not raise a hand against my older brother; If my father has died, let him be as a father for me.” And in another place he says, “If he (Svyatopolk) sheds my blood and resolves to kill me, I will be a martyr before my Lord. I will not resist, for it is written, God resisteth the proud, but giveth grace unto the humble. Boris and later Gleb did not want to shed the blood of their brother for the sake of achieving earthly glory and power, both consciously desiring to become like Christ, to learn meekness and humility from Him, and to attain blessed peace in eternity. Let us discuss this more in detail. The words we have are few, and the meanings many, and it turns out sometimes that one word accommodates various meanings. When it says, My strength is made perfect in weakness, it’s talking about humility—of that condition when a man, being whole, strives with all his soul for God, absolutely not trusting in himself; and in this desiring, in this hope in God, feeling his communion with His truth, he is ready to die for this truth. This is truly that weakness which unites a man with Christ’s victory over death. But there is another weakness, which the apostle Paul calls “weakness in faith.” This weakness is characteristic of the absolute majority of us. This weakness impels us to fight for our existence, for our lives, by any means, to fight even with weapon in hand precisely because we are little familiar with eternity, with the life of Christ, due to our lack of faith; and lack of faith impels us to cling to this earthly life. But here we are speaking about thoughts, feelings about yourself, about your life. If these thoughts (about the use of force) are connected with the need to protect other people—then here we can already speak about the manifestation of God’s power, acting according to the commandment, Greater love hath no man than this, that a man lay down his life for his friends (Jn. 15:13). The truth of God and participation in it does not in principle preclude the use of force. 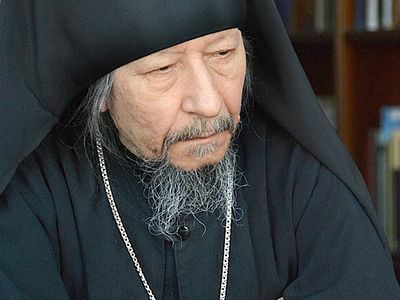 The most well-known dictum on this theme belongs to St. Philaret of Moscow: “Love your enemies, crush the enemies of the Fatherland, shun the enemies of God.” Thus, there exist Orthodox soldiers, and this isn’t some kind of oxymoron, but a distinct calling. We can serve God in different ranks and callings. Soldiers can also be Orthodox Christians, and can serve God and our Fatherland with weapons in hand. Thus, when Yaroslav, subsequently called the Wise and glorified among the saints, wanting to take vengeance against the murderer of his brothers, Svyatopolk the Accursed, went against him in battle and defeated him—in this instance Yaroslav was the right hand of Divine vengeance and was fulfilling the will of God. Generally, the question is not whether someone is a passion-bearer, or whether he’s a pious soldier or layman, wisely avoiding danger (and this can be a manifestation of the truth of God, because the Lord says, But when they persecute you in this city, flee ye into another (Mt. 10:23). The essence consists in a man clearly understanding his calling and remaining in humility within the bounds of this calling. Faith, a sensitive, daily search for the will of God, and an active striving to live according to His commandments are absolutely necessary for this understanding. In short, partaking in the truth of God is possible in various ranks, situations, and callings, but love for God, the desire to live according to His truth, and, of course, humility, are required conditions for all. Interestingly, the holy princes Boris and Gleb, meekly accepting death and not desiring to answer force with force, established themselves over time as brothers-in-arms for Orthodox soldiers in battle (and armed) against invaders and infidels. By their meekness and humble passion-bearing, the holy princes as if acquired the right to intercede before God for the Christ-loving Russian army, which once again emphasizes that the feat of military confrontation and the feat of humble passion-bearing are not opposed to one another, but represent two types of service to God. The love of Russian Orthodox people, and not just the ancients but also the moderns, for the holy passion-bearers is, I think, partially connected with our purely Russian characteristic of “pity”… we pity every innocent victim, and somehow especially feel the holiness and beauty of innocent suffering in general, and suffering for truth. Mainly, I think, it’s a trait of true Christian feeling—loving not those who are strong and powerful in some social sense, but those who are weak in that highest sense, in the sense of helplessness, and meek devotion to God. The holiness of the other passion-bearers—Tsar Nicholas II and his family—also lies in the fact that they grasped God’s will and did not look for salvation from mortal danger, but, preserving their union with holy Orthodoxy and with Christ unto the end with humility, walked the path appointed for them by God. But what does it mean—appointed? Did God really desire such a horrific end for these good people? No, of course not, but to understand the meaning of passion-bearing, we must recall the teaching of the holy fathers on the “three wills” of God: His good pleasure, economia, and allowance. Of course, this division of God’s will into three is a well-known convention, which helps us understand in part the actions of Divine providence in this world. “The first will,” by His good pleasure: If He at times allows a virtuous man to experience the action of evil upon himself, then it happens only for his soul to be perfected in tribulation, having acquired the skill of patience, confirmed in humility and hope in God. “The second will” is the will according to economia, when the Lord allows us to commit evil in order to correct a sinner, to bring him to repentance and sobriety, and to purify him from sins by means of suffering. Finally, “the third will”—by allowance—abandons a man (absolutely incapable of repentance and correction) to walk the paths of sin, even unto destruction. The Psalmist David speaks about this, exclaiming, The death of sinners is evil. On the basis of this teaching “on three wills,” we can say that God’s will in relation to the holy passion-bearers is His will according to good pleasure, facilitating the initiation of good Christians into holy eternity, the joy of which is the joy of perfect communion with God, surpassing all imaginable joys. And if we grieve excessively about the frightful and martyric death of these blessed people, such as the holy princes Boris and Gleb, or the royal family, it is only because we do not understand what crowns they were blessed with in eternity for their faithfulness to Christ, for their humility, and their great selflessness! The body of Gleb, forsaken in the wilderness between two logs, a pillar of fire over him and angels inclining towards him. Scene from an icon from Sts. Boris and Gleb Church in Zaprudi, Kolomna. Late fourteenth century. The first Russian princes glorified by our Church were the sons of the Equal-to-the-Apostles Prince Vladimir—a man brave, strong, and militaristic, but also able to preserve peace in the time of his sovereign reign. Upon adopting the Christian faith, he displayed a special softness of soul. Once he wanted to release some robbers from prison, but was stopped in time by the words of a wise Greek bishop. Sts. Boris and Gleb, as their eulogy, written soon after the murder of the princes, describes them, were distinguished by outward beauty and fervent piety, but also by an enlightenment of mind. The brothers greatly loved one another and enjoyed the deserved respect of the people. The princes were quite ready to reign in those specific cities which their father had given them, and to rule the people with a firm hand. But the time of their suffering drew near. Prince Boris, having sufficient hosts to withstand Kiev and Svyatopolk the Accursed, his brother from another mother, preferred a martyr’s death to armed resistance. He did not want to spill the blood of his brother, did not want to cause civil strife, did not want to be the indirect cause of a fratricidal civil war, which sounds especially relevant now in connection with infamous events. Gleb, the brother of Boris, fully entrusted himself into the hands of the Lord. The holy princes did not want to raise arms against their kin, placing their hope in Divine providence—which turns evil acts to good consequences—and desiring to become in a certain sense like the Savior, Who prayed and besought the Father for His crucifiers: Forgive them; for they know not what they do. Both princes were brutally murdered by hired assassins sent by Svyatopolk. The life of Boris and Gleb expressively and eloquently testifies how they groaned in fear of death, how they asked the assassins not to raise their swords. Not recanting their resoluteness, they paid with their own blood. And what happened then? The wrath of God overtook Svyatopolk. His fate is quite reminiscent of that of Cain, who was driven by delusions of persecution, and evil took his life. The bodies of Sts. Boris and Gleb were found to be incorrupt. People in the most desperate of circumstances—prisoners, those condemned to death, and the hopelessly ill—soon began to call upon both these passion-bearers. Sts. Boris and Gleb, as we know, spiritually encouraged their kinsman Alexander Nevsky, promising him their heavenly help in battle with the Swedes at the Neva River. Their widespread veneration began immediately after their suffering end. Our people saw in the passion-bearers daring intercessors before God and speedy defenders in all troubles and assaults. Is it permissible to connect the fate of Sts. Boris and Gleb with the life of the Tsar-Passion-bearer Nicholas II, called a great martyr in the Russian diaspora? I think we can and must contemplate this, because of recent historical research, which speaks of the pervasive conspiracy around the Tsar, of the forcible seizure of his orb and scepter. His abdication is a question for discussion; it, as you know, was not prescribed by any laws of the Russian Empire. The text of the abdication and of the subsequent manifesto have very dubious origins. These documents were prepared by the party of traitors, whose activity withdrew into anti-Christian masonic lodges. I think that in the near future, all the dark sides of this conspiracy will be revealed. In any case, after the arrest of the tsar, no one provided him the opportunity to publicly speak. He was in complete isolation all the way up to his martyric end. It is known that his journal went through the hands of the Bolsheviks, who took care to conceal the truth. One thing is certain: The spirit of our tsar—a meek, calm, noble, generous man, is akin to the holy prince-passion-bearers Boris and Gleb. The tsar was against personal revenge for himself, and he instilled the same in his children. Today we see his bright face on icons, surrounded by the radiance of holiness, while at the same time, his murderers were direct political opponents, and all those in the West who planned this crime of universal scale, scorned by all, have been consigned to historical oblivion. Our times give us no cause for slackening. The Russian world is resurrecting today, and the Orthodox people are calling upon the Russian God-pleasers in their prayers—Sts. Boris and Gleb and many other holy princes, and the Royal Martyrs, believing that by their intercession before God, our land will again find its integrity, and our people the moral strength to withstand worldly defilement, and for raising our children in Christian morality. Speaking of the mysterious fate of the last Russian tsar, looking back in retrospect on the beginning of the Russian state, on the beautiful faces of Sts. Boris and Gleb, we see in them the radiance of the grace of Christ. The Savior, the King of kings, the Lord of Lords, God Almighty, concealed the power of His Divinity under the veil of flesh. The Lord did not forcibly taste bitter death upon the Cross, not being compelled to it by His persecutors, but he went to this death with a wholly different purpose—to redeem all of mankind, and to breathe into it through His death and Resurrection a “shot” of Divine grace. These chosen saints of whom we are speaking were inspired by the podvig of Christ with the thought of conquering worldly darkness with their meek and humble love, and the ability not to avert their faces from their abusers and mercenary assassins. Having paid for their convictions with blood, already beyond the bounds of earthly existence, they boldly pray at the throne of the Holy Trinity for the fate of their homeland. And throughout all subsequent centuries, right up to the Second Coming of Jesus Christ, they will manifest Heavenly aid to the Russian people. We believe that the prayers of these saints are a shield and protection not only for Russia and other meek, longsuffering, and merciful countries, but also for brave and resolute people, ready to come out against an aggressor in fulfillment of the covenant of St. Alexander Nevsky: “God is not in force, but in truth! Whoever comes to us with the sword of aggression and malice will die by the sword.” Amen. A “podvig” is a great or heroic feat, usually associated with great ascetics in an Orthodox content. In the context of passion-bearing it refers not to the typical understanding of asceticism—prayer, fasting, prostrations, etc.—but to the deeper spirit that undergirds all Orthodox asceticism—that of having no greater desire in this life than to be united to Christ and to become like Him. The Russian word here is “жалейность,” which does not exactly correspond simply to “pity,” but is a particular kind of pity, as Fr. Dimitry explains. 18 km from Rostov lies the settlement of Borisoglebsky. 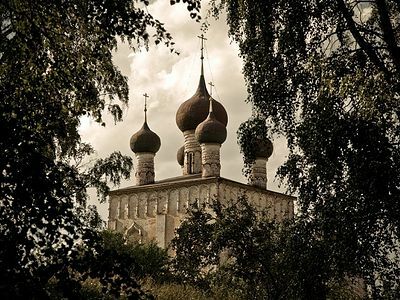 Its main attraction is the monastery, founded in honor of the first Russian saints, Prince Boris and Prince Gleb. Thank you for this explanation, Father. I have been confused about whether as Orthodox we must be pacifist and never defend ourselves, or whether sometimes it is permitted. I used to think, well, St. George was a soldier, so it must be okay to defend ourselves, but then recently I heard an Orthodox scholar saying that all of the ancient soldier saints were in fact martyred after they refused to continue to fight for the pagan armies - that in fact, the stories were changed much later to hide this, to make it seem they were Christians serving in pagan militaries until they were martyred for their faith. I'm still not sure what to believe about that. But your explanation about the 3 types of God's will is helping me tremendously as far as our own lives go.